Babies and children benefit from Chiropractic care, too! Pediatric chiropractic care is about helping keep kids healthy! Dr Jacobs sees kids to help with ear infections, colic, digestive problems, when they are sick or have had injuries. He has also had success treating kids with panic attacks, anxiety and anger issues. Help your kids with chiropractic care! Kids have spines, muscles, and nerves just like adults. They feel pain when they fall and can get spinal restrictions from daily life. The first chiropractic restrictions can occur during labor and delivery. Kids heal quickly from injuries and respond great to chiropractic. Best yet, kids LOVE to get adjusted! Let’s take great care of our children together starting with chiropractic care! ASK US ABOUT OUR REDUCED FEES FOR KIDS, Call our Oceanside chiropractic office today! Dr. Jacobs and his wife, Angie, are a CLASS ACT! They are so personable and caring and accommodating too! I walked into his office one day while walking my dog in the area. I was 5 months PREGNANT and my SCIATIC NERVE pain was paralyzing! I could barely walk, and more importantly, play with my 3-year-old. After one visit to Dr. Jacobs, I was instantly able to function! Weekly visits were necessary during the remaining months and kept me PAIN FREE. I am truly grateful! But wait, there’s more… my preschooler was born a micro-PREEMIE (weighing 1 lb!) and has had issues with behavior as well as constipation. She started seeing Dr. Jacobs twice monthly and seriously, the change was instant! She became more relaxed and CALM, and regular, too. Plus, she loves him! She drinks water and says, “Dr. Jacobs says I have to drink a lot of water to be healthy.” So, I love him for helping my baby girl! So, basically, Dr. Jacobs has become our FAMILY DOCTOR! He not only helps us feel better with regular adjustments, he also offers great wellness advice that is holistic and natural, with a gentle and caring manner. Thank you, Dr. Jacobs! My husband referred me to Dr. Jacobs after meeting him at a networking group. I had previously had experience with Chiropractic care but didn’t even know it was possible for Chiropractors to treat children so I called to simply ask if it was possible and to see if I felt comfortable with it. Dr. Jacob’s was so gracious and gentle. He encouraged us to come in for a consultation and assured us that Chiropractors do indeed treat children and are trained in safe, gentle and effective techniques specifically for children. He put my son Harrison at ease and is truly wonderful with children. He was very perceptive and intuitive regarding exactly how to personalize Harrison’s care. Harrison felt completely comfortable and trusted him from the very beginning and throughout his treatment. Harrison’s ear infection did in fact clear up and we have taken Harrison back periodically for preventative check ups and at the first sign of any infection. His immune system has definitely been strengthened and he has been able to avoid antibiotics since we started seeing Dr. Jacobs. He turned 3 in February so it has been over a year that he’s been cared for by Dr. Jacobs. When we first inquired about Harrison being seen by Dr. Jacobs I was concerned that it would be too expensive if our insurance didn’t cover the visits but one visit to Dr. Jacobs is less than the co-pay to see his pediatrician and definitely less than paying for antibiotics! We have found in our family that it is always a wise financial decision to pay for preventative care and invest in our long term health! I have sent many of my friends with toddlers to see Dr. Jacobs with confidence that they will have the same wonderful experience that we did. My husband, my son and I all get treated by Dr. Jacobs and have all benefited from his expertise and wisdom. We recently moved to Carlsbad and my oldest daughter got a cold. I knew that I needed to find a new Chiropractor, I checked out a couple of doctors and found Dr. Jacobs and Angie. We are so happy here. With a couple of treatments and lots of rest and water, Jasper was back to new. Both of my children have gone to the Chiropractor since birth. Chandler, my youngest, got chronic ear infections. I never gave her antibiotics, just natural remedies prescribed by the doctor (chiropractor) and adjustments. She is now six years old and no more ear infections. I know many people go to the MD when they get sick. We go to the Chiropractor. Dr. Jacobs is awesome. He has nursed us back to health many times. He is also honest, if he thinks you need to be seen by an MD, he will tell you. It is always a great experience to go to Carlsbad Wellness Chiropractic, Angie is delightful. My kids will tell me, mom, I think I need and adjustment! I also love the prices for kids, very affordable. I know that my children benefit from chiropractic, I am grateful to have found such a caring place to receive treatments. 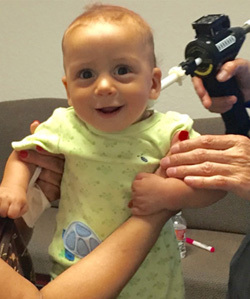 I brought my 2 month old son, Ryden, to Dr. Jacobs after he was diagnosed by his pediatrician with torticollis. it was believed this disorder was caused from possible trauma at birth. Ryden was unable to turn his head to the right without much discomfort and crying. We began to see results immediately after starting care with Dr. Jacobs. Chiropractic care has helped Ryden a lot! This has had a great impact on our lives, because my son is no longer in pain, he is much happier and is able to sleep better and longer at night. He is able to turn his head and is catching up developmentally, and is able to do mini-pushups while lying on his stomach, as well as rolling over. I would highly recommend Dr. Jacobs to anyone contemplating chiropractic care.